Take to the sea! We rent sail boats to qualified sailors. Click to see prices. 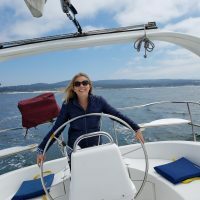 Sail Monterey Bay, Book Now! Sail beautiful Monterey Bay! We offer daily public and private cruises as well as our famous sunset appetizer cruise & much more! Give the gift of sailing! Click here to buy a gift card for a friend or a loved one and have it immediately emailed to you. Sail Monterey, the only sailing company that departs from the Old Fisherman’s Wharf in Monterey. Our fleet is comprised of five different sailing vessels. So, whatever your sailing taste, big boat or small, mono hull or catamaran, Sail Monterey can cater an experience to your dream excursion. Sailing is an eco-friendly way to see the bay. Our sail boats use the power of the wind on 90% of each trip, burning diesel only to exit and enter the harbor. Meanwhile, other boating trips consume huge amounts of fossil fuels. Our guests also love that our cruises are limited to six passengers per trip. Smaller capacity cruises provide a much more quiet and intimate experience, and a chance to sit next to the captain and ask questions. We employ many experienced captains, all who love sharing their passion for sailing and the beauty of the bay. So don’t be afraid to learn how sailing works or ask why sea lions never stop barking! Have you always wanted to learn to sail? Our licensed instructors have taught and certified boat loads of happy students. We proudly offer American Sailing Association certified courses. ASA certifications are valid for life and recognized internationally. We are dedicated to teaching safety and seamanship and give you the confidence on the water. Once certified, you can qualify to rent our boats. 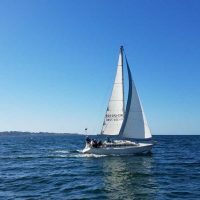 If you would like a casual pace, we also offer individual sailing lessons for those that want more time on the water to hone their skills. Can I Rent a Sail Boat? 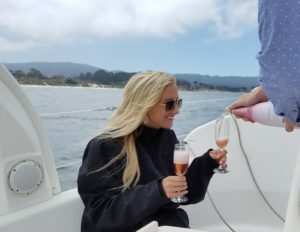 Here at Sail Monterey, we specialize in sailing cruises on the bay. Whether you want to sit back and sip wine or have a hands on sailing experience, we cater the cruise to your liking. Let us know what you are looking for and we will make it happen. Capt. Paul provided an outstanding tour of the bay! Experience was as if a friend took us out on his boat. Excellent directions to the landing point and perfect recommendations for local lunch restaurants. Definitely recommend this tour! My daughter and I rented the 22ft Catalina and sailed off for three hours into the bay. These guys were really professional. They gave me a radio, a cellphone number and they had anticipated little extra details on board such as a jackets, drinking water and sunscreen. We had a wonderful time on the cruise with Capt Dan. We were with two other couples and the captain who manned the sail boat all by himself! The snacks were yummie, the wine was plentiful and the views! Wow! 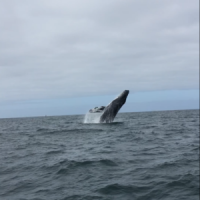 We were able to see tons of otters with their kittens, sea lions and we even saw a few whales in the distance! Not to mention the beautiful sunset over the water. 10/10! Really enjoyed our captain, Wim, who was personable and friendly. Perfect impromptu sailing excursions which are intimate for a casual price. Sailing boats available were in really good shape and fun to be in. 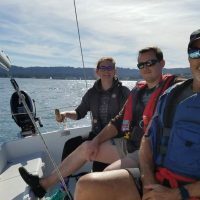 My husband and I are learning how to sail and Paul has been a very kind, fun and professional teacher. He is passionate about sailing and it is obvious that this is not just a job for him. We are so excited to continue learning under his tutelage. Futhermore, the boat is beautiful, comfortable and impeccably maintained. We always feel safe and comfortable.